Published in Rafu Shimpo, September 30, 1970, Japanese section. 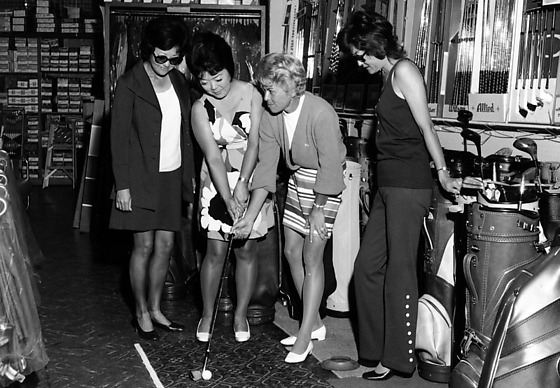 Professional women's golfer Barbara Romack teaches three Japanese American women golfers at L.A. Sporting Goods in Little Tokyo, Los Angeles, California, September 30, 1970. Caucasian woman guides a woman in floral print dress holding a golf club as two other Japanese women wearing sunglasses observe in store. Golf bags, golf clubs and other accessories in background. They are identified (left to right): Ms. Uchizono, Ms. Hamano, Romack, Ms. Norikawa. Typed on original envelope: Women Golfers -- LA Sporting Goods. L.A. Sporting Goods was located at San Pedro and East Second Street in Little Tokyo, Los Angeles, California.